Taking time for self-care is essential, especially for busy parents. I know it's something I have to be very intentional about in my own life, or I can easily get burned out. Today's guest post about joyfully taking time for yourself is from Gretchen of That Mama Gretchen. Please read to the bottom to learn more about today's guest blogger. The ones you had as a child which you now share with your own. And some, with words that ring so true. Who would have guessed? I remember laughing with my mom as we read this book years ago. I thought it was so funny that the mama elephant needed a break from her children. My mom would remind me that all mommies need a break every now and again. I was baffled. Who needed a break from children as sweet as my sisters and me? Well, with my sweet Jemma following me to and fro all. day. long. 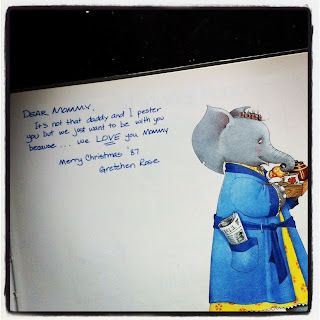 I now know how mama elephant and my own mom must have felt each and every day. As a mama I don't get a break unless I demand one or intentionally carve out my own five minutes' peace. Since being at home full-time with Jemma I've had my bouts of self-doubt (Am I really cut out to be a stay-at-home mama?) and self-pity (Is anyone ever going to notice all the things I do around here?). It's in those moments I know exactly what I need. I need five minutes' peace ... and fast! Those are the days where I ask my husband for a quiet night. Mama needs to rejuvinate. And yes, I know it is only Tuesday :) He rocks Jemma to sleep and snuggles her into bed. He mans the monitor while I draw a bath. I remove all the bath toys, add my favorite bath salts, light a candle, and grab a novel instead of a bath book. I breathe a sign of relief. Five minutes' peace, all to myself. I love my daughter to the moon and back. Our days are filled with adventures and learning, snuggles and mishaps, chores and tantrums, and I wouldn't trade it for anything. But, to be the best mama I can be, I have to take care of myself too. Oftentimes, five minutes' peace is the perfect solution to prepare me for Wednesday ... and all the days that follow. 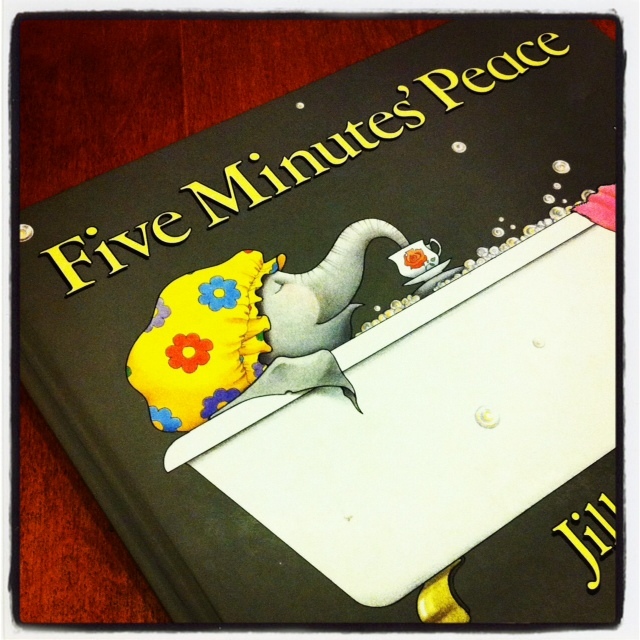 How do you find your five minutes' peace in the busyness of each day/week? Gretchen blogs over at That Mama Gretchen where she shares about her days with a toddler and a bun in the oven sprinkled with memos about her attachment parenting experience, thrifty finds, crafty projects, and her goal of becoming more green. Stop by for a visit! You can also find Gretchen on Twitter, Facebook, and her favorite, PINTEREST! I love this post because this was me after Liam was born. I needed the quiet of the bathtub for so long. Now, my quiet time has morphed to swimming alone in a lane at the Y. It's where I'm at and I'm finally wise enough to embrace it!